Editor's Note: This post, by Enough Project Field Consultant Aaron Hall originally appeared on ThinkProgress. The views expressed here are his, and do not reflect the official policy or position of the Enough Project. I live less than a mile and half away from Nairobi’s Westgate Mall. The four-day siege on the shopping center rocked our community. Many of my friends and colleagues were there, texting me from their makeshift hideouts in stairwells and utility closets. Thankfully, they all made it out — though the same can’t be said for the hundreds killed or wounded by the al-Shabaab attack. As the grisly task of sifting through the rubble for survivors, clues, and bodies begins, the Kenyan government will need to address the assault’s psychological fallout. Though this particular incursion has been beaten back, al-Shabaab has yet to be driven out of its Somali base. The nature of this recent attack raises the specter of a “new normal” for Kenyans and particularly residents of Nairobi, wherein attacks on so called soft-targets like Westgate Mall scare people away from high-profile public places because it’s hard to secure them fully. Kenyans are now faced with the challenge, as victims of mass casualty attacks in New York City, Washington D.C., London, Madrid, and Mumbai were, of collectively overcoming these anxieties and returning to normalcy as soon as possible. Beating terrorists requires beating back the terror their acts are calculated to inspire, which depends crucially on learning of the truth about what happened and having an open conversation about what needs to be done to prevent another tragedy. To date, neither the Kenyan government nor its international partners have fully answered central questions about the incident, the attackers, or the implications for the day-to-day lives of the Kenyan people. Here are four critical areas of public concern that, going forward, Kenyan officials will need to address for Kenyans to begin to heal and once again feel safe. 1. How many gunmen initially entered Westgate Mall, how many known accomplices exist, and how many of each are now accounted for? Scant details currently exist publicly on the number of attackers and their accomplices. Do the gunmen remain at large? If so, what is being done to find and arrest them? Is there closed-circuit imagery from inside the mall that allowed authorities to arrive at a precise headcount of the attackers? The public needs full answers to these questions. Uncertainty leads to increased anxiety. Further, if information does exist and is made public, it can assist in official efforts to identify the whereabouts of these individuals before they are able to flee the country or disappear underground. 2. To what extent did the attackers gain access to the mall in advance of the attack to collect intelligence and plant arms or other supplies? As reports surface about the extent to which the attackers had access to the mall in advance of the attack, citizens must be made aware of as much information as possible about how this happened. Did members or individuals sympathetic to Al-Shabaab own shops in the mall? Might security guards, officials, or any other employees suspected have collaborated with the attackers? If weapons were stored in the mall in advance, how were they brought in undetected? Disclosing what the government knows on these fronts preempts rumors that can exacerbate public anxiety about the capability of the attackers and helps citizens who are determined to worry know what to look for in a follow-up attack. 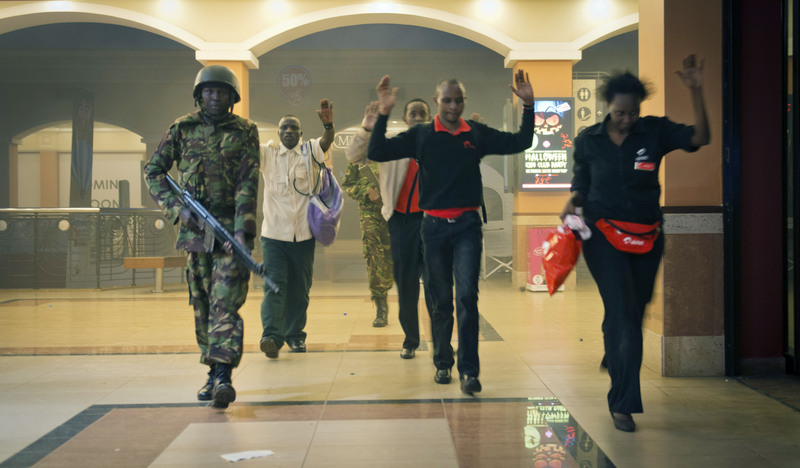 Photo: Civilians walking out of Westgate mall, Nairobi, Kenya (AP).